Baton Rouge-born bluesman Slim Harpo was one of those easy-going, stay-out-of-trouble-type good guys in comparison to many of his contemporaries, the blues shouters who chronicled their hard-drinking, street-fighting, jail-visiting, womanizing ways in the lyrics of their songs. Slim, born Isiah Moore (his legal name later became James Isaac Moore) in 1924, began applying his musical craft not long after reaching his teens; by the time adulthood came he was performing steadily, carrying a tackle box filled with various types and brands of harmonicas to every show. His even-keeled personality was discernable in his music, the best-known of his repertoire usually dealing with love and romance (his wife, Lovelle Casey, regularly contributed to his songwriting). One downside to his congenial nature was that he avoided confrontation...and was taken advantage of, business-wise, as a result. He grew up in the Lobdell neighborhood of Baton Rouge with parents Clyde and Pearline Moore, older sister Tilda, younger sister Doris and a stepsister, Lillie Emerson, from his mother's earlier marriage. Young James was exposed to the music of the area (blues, Cajun, zydeco and all things swamp-related) and decided early that he wanted to be part of the local scene. Both of his parents had passed away by the time he was 16, leaving him responsible for his three female siblings, so he worked on the docks in New Orleans and took construction jobs, fitting in as many club dates as possible using the professional name Harmonica Slim. J.D. Miller, a record producer and promoter from nearby Crowley had recorded Lightnin' Slim (real name: Otis Hicks) for his Feature label in the mid-'50s; James knew Lightnin' from seeing him perform, which gave him an "in" with Miller. 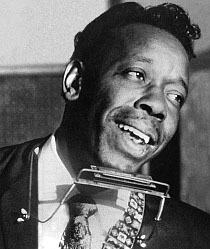 In 1955, the younger Slim played harmonica on the older Slim's Excello Records single "Lightnin' Blues.". Miller locked Harmonica Slim into a contract. 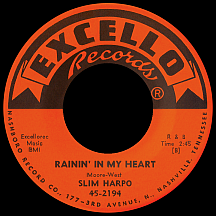 Ernie Young, who owned Excello (part of the Nashboro company of Nashville, Tennessee), was interested in James/Slim, but was also aware of a Los Angeles-based singer, Travis Blaylock, who'd used the Harmonica Slim name for several years. So Moore's professional name was altered slightly: Slim Harpo put the "skinny" part up front, followed by a synonym for his musical instrument, the result a more unique moniker that people would still be using in conversation decades later. 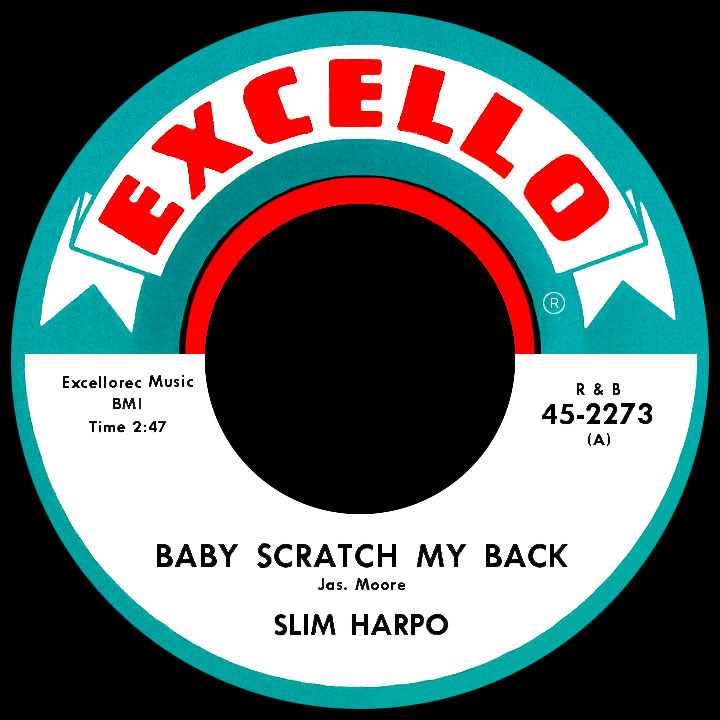 At Harpo's first recording session in March 1957 he waxed a number that is considered a classic of the blues genre as a result of a unique performance by Slim and enticing, slightly-off-color lyrics, sparked by a series of events over the years that made it a well-known standard. It's not that "I'm a King Bee" was particularly original; Memphis Minnie's 1930 recording of "Bumble Bee" on Vocalion had covered similar ground, other bee-themed songs followed and there was even a singer named Bumble Bee Slim who recorded for many labels in the '30s including Paramount and Bluebird. Also, the 1951 "Honey Bee" by Chess bluesman Muddy Waters can be considered inspiration for Harpo's tune. The lyrics, 'Well I'm a king bee...buzzin' around your hive...well I can make honey, baby...let me come inside,' were delivered nasally for a "buzzing" effect along with 'sting it...' guitar licks. The song wasn't a chart single, but timing was right in another sense: certain teenage blues fans across the Atlantic, who would carry a lot of clout someday, heard the song and didn't forget it. The single's flip, "I Got Love if You Want It," also had staying power; Warren Smith put out a version on Sun later in the year and it wouldn't be the only one. The rest of Harpo's scant '50s output ("Wondering and Worryin'" and "You'll Be Sorry One Day") were very good, though less distinctive than the debut disc. 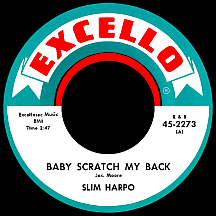 1960's "Buzz Me Babe" (a telephone song with a title that reprocessed that first effort) and "Blues Hang-Over" were stronger efforts; Slim was as authentic as any of the top blues singers...and in the spring of 1961, he joined them on the charts. "Rainin' in My Heart" hit the rhythm and blues top 20 in June while developing more slowly on the pop charts, where it reached the top 40 in July. The song might be considered too pop-leaning or sentimental by blues purists, but its widespread radio exposure helped bring him many new followers. Shortly after this breakthrough, Slim and J.D. Miller reached an impasse over non-payment of royalties and rather than deal with it, Slim just took off. He laid down a few sides for Imperial Records, but those were never released because of Miller's iron-clad contract. Ernie Young could have put out singles of earlier recordings but opted not to, effectively squelching any chances of getting a follow-up to the hit. Slim spent the next two years on the road, performing mainly in the south and southwestern U.S.; at least he was able to take advantage of the fame his hit had given him, while Miller and Young were unable to cash in beyond the money they'd made on "Rainin' in My Heart." 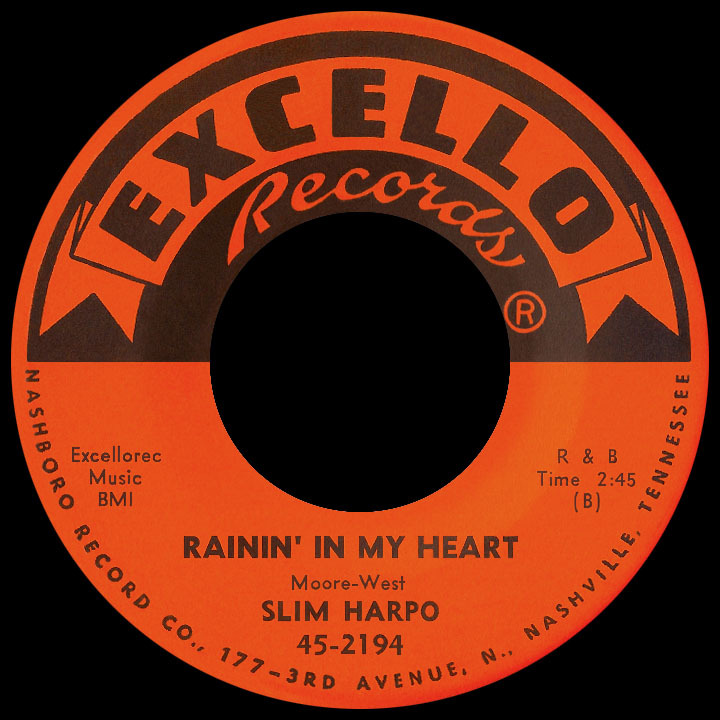 More than two years passed before Harpo and Miller negotiated a new contract (giving Slim full songwriting royalites under his given name, James Moore, even though his wife continued to make contributions) and in the fall of '63 a new single finally appeared on Excello: "I Love the Life I'm Living," a romantic song with a bit of a gospel feel. He continued reutilizing earlier material with songs like the instrumental flip "Buzzin" and unnecessary sequels "Little Queen Bee (Got A Brand New King)" and "Still Rainin' In My Heart." For quite some time, Harpo was unaware of the stir his music had caused among musicians in Great Britain. A door to the next level opened when The Rolling Stones included "I'm a King Bee" on their 1964 debut album. When asked about it, Mick Jagger replied, "What's the point in listening to us do 'I'm a King Bee' when you can hear Slim Harpo do it?" Well, the point turned out be that millions of people might never have discovered the Baton Rouge bluesman otherwise. More British rockers paid homage; The Kinks did "I Got Love if You Want It" in the studio and The Yardbirds offered up a live version; later, the Stones modified the title for their first concert album, Got Live if You Want It! Slim's biggest hit came with a laid-back spoken plea set to a chicken-scratch beat with added percussion played on skull heads by Lazy Lester, one of Miller's regulars. A 46-second harmonica warm-up prefaced a quick bit about a service Slim's wife performed from time to time ('...come here baby, scratch my back...I know you can do it, so baby get to it...now you're doin' the chicken scratch...aawww...that's what I'm talkin' 'bout!'). Its sound was unlike anything else on the 1966 airwaves. Could it be a hit? The answer was yes: number one R&B in February and top 20 pop in March and April. James Brown (who'd done his own instrumental titled "The Scratch" in '61) dug it in a big way and invited Harpo to tour with him for several weeks while the single was high on the charts. Then blues harmonica man Frank Frost jumped on the bandwagon with "My Back Scratcher," a minor R&B hit on Jewel late in the summer. Finally breaking ties with Miller, Harpo continued to record for Excello. Later singles had more of a dance beat and were successful regionally: "Shake Your Hips," "I'm Your Bread Maker, Baby," "Tip on In" and "Ti-Ni-Nee-Ni-Nu" all reached the national charts between late 1966 and early '68 (those last two made the R&B top 40). Remakes like "Mohair Sam" (a mostly-spoken take on Charlie Rich's 1965 hit) and "Folsom Prison Blues" (the Johnny Cash classic) fit right into his wheelhouse. The late '60s were a good time for Slim Harpo and he was on the verge of putting together a tour of England, where demand for had been on the rise for some time. It all came to a grinding halt when he died of a heart attack, unexpectedly at age 45, on January 31, 1970.